Hollywood composer Max Steiner’s score and the fact this was legendary director Raoul Walsh’s final film are the main points of interest to this wild west adventure yarn. Steiner, the man behind such iconic movie music for films as King Kong, Gone With The Wind and Casablanca among many others, brings a militaristic flavor to his duties, though its by no means his most memorable work. Director Walsh, veteran of over 50 years whose other films included The Roaring Twenties, White Heat and Captain Horatio Hornblower, stages the action well enough but he’s hampered by somewhat impassive performances by the then-married Troy Donahue and Suzanne Pleshette, both too rooted in the 1960s to come over as being authentic for the period. Walsh handles the material, based on Paul Horgan’s book, sensitively and attempts to make up for decades of screen insignificance by dignifying the Native Americans by having them speak in their own language, with subtitles as appropriate. However, despite the Technicolor and widescreen framing, with William Clothier expertly capturing the Red Rocks and Grand Falls locations beautifully and certainly deserving praise, A Distant Trumpet is really just a basic “cowboys and Indians” outing. A love-triangle plot introduced part way through doesn’t really help to further things along and, without wanting to pun on its title, there’s a distance one may feel in becoming involved in the situations, the camera often not quite making a direct connection with the characters. But among all their relationship talk, the film is lively enough and periodically full of action, especially during a raid that garners more horses for the cavalry and an ambush/showdown, which is generally impressive in its sheer numbers. 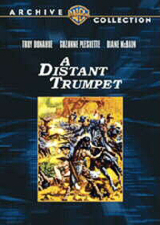 It could be that as I’m not a massive Westerns fan, this just wasn’t my preferred kind of viewing, and although A Distant Trumpet has received good words from others in the past and may enthral those with these particular tastes, I found it to only be a so-so and fairly standard addition to the genre. A nice surprise is the inclusion of the film’s original theatrical trailer, in which director Walsh, with eye patch in place, sensationally proclaims the film as containing some of the best scenes he’s ever filmed! It’s sensationally sensationalist, shown in 4:3 “fullframe”, and satisfactory in presentation. The format can change between titles, with some progressively transferred while others can be interlaced, but the effect is the same: very good versions of otherwise hard to find movies. I was particularly impressed by the stability of the elements used and the solidity of the coloring. A Distant Trumpet might have undergone some edge enhancement, though this could genuinely be result of the high contrast sunlit scenes. Despite a few nicks and flecks here and there, these are the best I’ve ever seen any of these titles looking on my display. As with the image, Warners have been fortunate in sourcing very good audio for the tracks included on these discs. Considering that these masters have been either used for TV or LaserDisc transfers in the past, or have been newly minted for future use, one can feel safe in the knowledge that the mixes offered are well up to the Studio’s stringent quality levels. Rest assured that Warners hasn’t just simply used the nearest old print with a scratchy, humming soundtrack: these are all again as good as can be expected without going the whole 5.1 remix or restoration route. Due to their age, most of the tracks are in their original mono configurations, but are all direct sounding and clear.